What did you think about the 2015 LetiDays Grenoble edition? CEA-Leti, a leading global center for applied research in microelectronics, nanotechnologies and integrated systems, is proudly hosting its 17th LetiDays on June 24–25, 2015, and associated seminars and workshops on June 22nd, 23rd and 26th. Themes for this year’s gathering include Internet of Things-augmented mobility, which is revolutionizing the way we interact with appliances, infrastructure and countless common objects that are part of our daily lives. Managing these connected devices and the services and apps they offer is a growing challenge, but the IoT also will provide a wide range of opportunities for our economies. Another theme of the conference will be Leti’s technological breakthroughs in silicon technologies, sensors, telecommunications, power management in wearable systems, health applications, the transport market up to the factory and cities of the future. The focus will be on how to bring increases in performance, efficiency and security to these fields and markets. The two-day event will feature 40+ conferences, many networking opportunities, a showroom and exhibition halls. You will be able to hear and meet market leaders, startups, analysts and Leti technology experts. 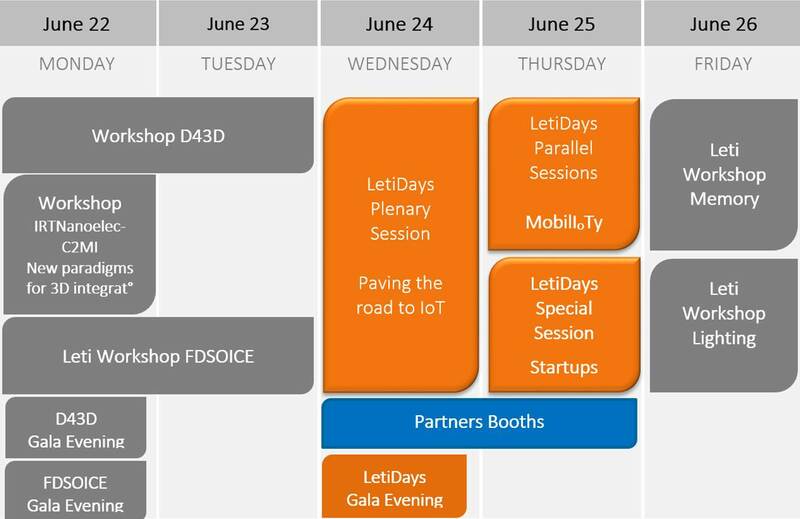 As with every LetiDays event, you will be presented a comprehensive vision of the latest innovations in key technologies and markets, and you will be provided with opportunities to complement your roadmaps with Leti expertise. The D43D'2015, the 7th Workshop on Design for 3D Silicon Integration, will happen in Minatec on 22-23 June 2015. For the first time this year, a new event, IRT/C2MI Paradigms for 3D workshop, also dedicated to 3D technology, co-organized by LETI, C2MI (MiQro Innovation Collaborative Center) and Sherbrooke University will take place during the LetiDays on 22 June, and will be co-located with the D43D'2015 event. On June 22-23, Leti will present his first workshop on FDSOI. This Forum brings together key actors from Academia, semiconductor companies, system design houses and EDA industry to build a vision of the strategic directions and state-of-the-art in FDSOI ICs design. On June 26th, Leti will present its seventh-annual workshop dedicated to the latest achievements in semiconductor memory technologies and, in parallel, the first workshop dedicated to smart lighting. This workshop will cover the entire solid-state lighting value chain, from material to LED process, packaging and lighting systems. Leti: your partner for innovative MEMS solutions. Join us at the Leti MEMS Workshop on June 23, 2015, during Transducers 2015 in Anchorage, Alaska. From 6:00-8:30 pm, DENA’INA CONVENTION CENTER – K’ENAKATNU EXE BOARD ROOM. For the fifth consecutive year, Leti is sponsoring LetiDay San Francisco during SEMICON West on July 14, 2015. From 5:00-9:00 pm, at the W Hotel, Social Terrace, 4th floor, San Francisco, CA.